When one reflects on the events last night in Parliament it is logical to consider the question: what was accomplished? Amendment i (Caroline Spelman) was carried by 8 votes, but is not binding on the government; so its purpose was what, bearing in mind ‘no deal’ is the legal default position if the Withdrawal Agreement is not accepted. Amendment n (Graham Brady) was carried by 16 votes and called for the Backstop to be replaced with ‘alternative arrangements’, but without specifying what the ‘alternative arrangements’ would be. In any event, within minutes of the votes having taken place the EU Commission, in the shape of Donald Tusk, had stated that the Withdrawal Agreement was not re-negotiable (link courtesy of Richard North, eureferendum.com). 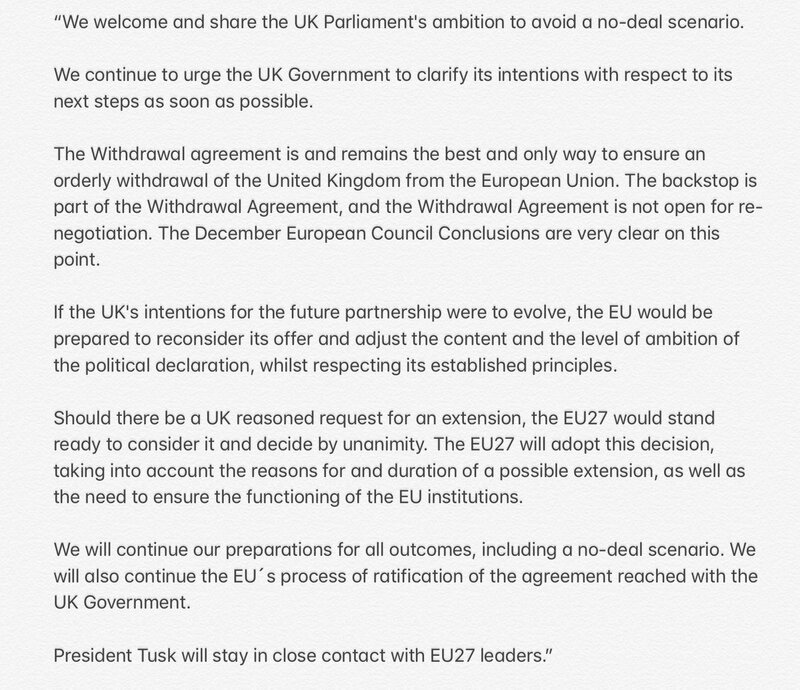 So just what was the point of the charade last night, lasting just over 6 hours, when at the end of the day MPs either accept the terms of the Withdrawal Agreement or the default of ‘no deal’? It is worth recalling that it was MPs that decided the vote to leave meant leaving the Single Market and the Customs Union; and thus corralled themselves in a cul-de-sac – all because they appeared incapable of realizing that there is a difference between being a member of the European Union compared to not being a member of the political construct of the European Union. Had that realization dawned on them then the obvious decision to have made would have been an application to rejoin EFTA and retain membership of the Single Market. I believe that this option is now as dead as a Dodo. It is a tad ironic that 650 people whose brains are as dead as a Dodo are now facing a decision with just two choices, both choices leaving this nation in a worse position than currently being experienced. Having decied to take control of our nations withdrawal from the European Union (a subject which at the beginning they knew nothing about – and still don’t) MPs need to remind themselves that a wise man fights to win, but he is twice a fool who has no plan for possible defeat. Come the next scheduled general election, by which time the aftermath of which ever choice MPs make will be more apparent. the electorate may well seek ‘retribution’ by voting out of office swathes of MPs who they feel have let them down. This then brings to the surface another charade: that of the choice available to the electorate under representative democracy. Just who do constituents vote for, another brain-dead candidate belonging to another political party who is no better than the one they wish to get rid of? The events of last night just confirm that MPs take we, the people, as fools. On the other hand to make democracy work, we must be a nation of participants, not simply observers. Whilst we, the people, remain the latter, perhaps our politicians are, for probably the first time, correct.